VAN EGMOND, ANTHONY JACOB WILLIAM GYSBERT (he signed Anthonij J. W. G. Van Egmond), settler and rebel; b. 10 March 1775 in Groesbeek, Netherlands; m. 1808 Marie Susanne Elizabeth Dietz in Mainz (Federal Republic of Germany), and they had five sons and three daughters; d. 5 Jan. 1838 in Toronto. When settlers during the elections of 1835 in Upper Canada shouted that candidate Colonel Anthony Van Egmond had come from the Five Points slum of New York City, they were viciously wrong. But it must have come as a surprise to him that his claim to be descended from the counts Van Egmond of the Netherlands was considered false. Indeed it was. When he died on 5 Jan. 1838 the truth about his origins was hidden. A baptismal certificate, now in the hands of a descendant and never questioned, is actually the result of a deliberate attempt to conceal his original identity. Van Egmond was born Antonij Jacobi Willem Gijben on 10 March 1775 at Groesbeek, Netherlands, the son of Johannes Arnoldus Gijben, schout (sheriff) of the region, and Maria Bloem, and he was baptized in the local Reformed church on the 12th. When the boy was 12 his father was found murdered, and in his 20s he became involved in criminal activity which forced him to flee to Germany. His offence must have been serious, for early in 1802 the superior court of his native province complained that repeated attempts to arrest him had failed and ordered that a determined effort be made to obtain his extradition to the Netherlands. Six months before the court’s statements, someone identified as a “prominent businessman” in Emmerich (Federal Republic of Germany) had requested a copy of Gijben’s baptismal certificate from the Groesbeek registers. It can be assumed that this document was used as the basis for the ingeniously contrived certificate hitherto accepted as genuine. Gijben’s parents’ names, his own name, and the names of some local residents are correctly given, but the claim made on the certificate to descent from the Van Egmond family was invented. The last count had died childless in 1707. The whereabouts of Van Egmond, as he now became, are difficult to trace for the next several years. He may have joined the merchant marine in northern Germany; another document shows his membership in a masonic lodge in London. In 1808 he surfaces in Mainz, where he was apparently either a functionary in the legal system or an army officer. Van Egmond’s life to 1819 is the subject of continuing research, but the information that has been found does not confirm the romantic stories told of him over the years. For example, he was not among the soldiers in Napoleon’s march to Moscow. Neither was he wounded at Waterloo as an officer in the Dutch contingent; his name does not appear on the official list of casualties. It is more than likely that his army service, if any, was of extremely short duration. The most that can be verified is that Van Egmond was on the fringes of military activity, probably involved in merchandising, supplies, and transportation. In 1819, with his wife and children, Van Egmond travelled via Amsterdam and Liverpool, England, to Philadelphia. Once there he continued to the area of Indiana, Pa, no doubt attracted by the possibility of purchasing land from the Holland Land Company. Van Egmond bought some land and settled there, but his life was anything but successful. Two sons and a daughter were added to the family, and although the older children were able to help out later, the success he sought stayed a respectable distance away from him. In 1826 his property was seized and sold at auction because taxes had not been paid. The road from Pennsylvania to Upper Canada was well travelled about this time, and Van Egmond must have heard about the riches and fertile soil of the British province. Soon after his arrival in 1828 he acquired 200 acres in Oxford East Township. This purchase of Canada Company land brought him into contact with John Galt, the company’s representative in Upper Canada. Galt saw in the newcomer a potentially useful person to help develop the Huron Tract, a million-acre triangle of company land bordering on Lake Huron. Not only could Van Egmond converse with the German-speaking settlers then immigrating to Upper Canada, but he also knew about working the land and about the movement of people and supplies. Furthermore, he was not unwilling to build roads in order to open up the bush. Van Egmond’s eminent suitability for his new role, his concern for the settlers, and his accomplishments give him a good claim to be considered a “father of the Huron Tract.” By 1832 he and his sons had built the major part of the road from Waterloo to Goderich and part of the stretch between what is now Clinton and London. Along the former road he established inns which were managed by his son-in-law Andrew Helmer, Sebastian Fryfogel, and Andrew Seebach, and he himself took care of one near Clinton. 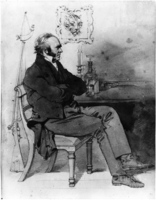 There in 1829 he produced the first harvest of wheat in the Huron Tract, and to mark the occasion several officials of the Canada Company, including William Dunlop, Samuel Strickland*, and Thomas Mercer Jones*, had dinner at his inn At the same time Van Egmond was becoming increasingly dissatisfied with the Canada Company. He apparently had lacked cash almost from the date of his arrival in Upper Canada, but the problem affected him in earnest when the company paid him for his services in the form of down payments on land. Moreover, although Van Egmond had access to several thousand acres, he was unable to make the further payments. He was also disappointed by the company’s failure to attract settlers and to build public works in order to stimulate development. Van Egmond had acted as the representative in the tract for the Colonial Advocate, and he had corresponded with its former editor, William Lyon Mackenzie*. 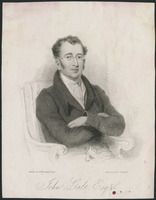 He wrote articles for the paper against the management of the Canada Company and even received the chance to appear before the select committee of the House of Assembly, chaired by Mackenzie, which in 1835 investigated grievances throughout the province. Van Egmond ran for the legislature in Huron County that year, but he was defeated by Robert Graham Dunlop. By the latter part of 1837 Mackenzie was making plans for an uprising in Upper Canada, and because he believed Van Egmond to have had considerable military experience he invited him to take command of the rebel forces. Although Van Egmond readily agreed, he arrived at the rendezvous at Montgomery’s Tavern north of Toronto three days after the uprising had begun because Mackenzie had advanced the date from 7 December. He quickly became convinced that the rebel cause was hopeless but remained throughout the skirmish which took place on the 7th between the rebels and government forces. Once the rebels were defeated he attempted to escape, but was taken and jailed in Toronto. There he contracted a fatal illness, for whose treatment he was transferred to the Toronto General Hospital on 30 December. To the end he professed his innocence, but even his sons did not believe him. After his death most of his land was sold to pay his debts; his sons managed to retain enough to take up their father’s plans, although without his political convictions. Naturalized in 1841 and 1842, they established successful enterprises in what later became the village of Egmondville. Perhaps Robina and Kathleen Macfarlane Lizars, in their reminiscences of the Canada Company, were correct in thinking that Van Egmond might have been spared for a longer life “had he not taken up misunderstood politics in a foreign land.” But he had had the misfortune of becoming disenchanted with the Canada Company before many others. [The above account is mainly based on original research done in Canada, the Netherlands, Germany, and Pennsylvania. In the Netherlands, the following materials at the Rijksarchief in Gelderland (Arnhem) proved useful: baptismal records in Inv. no.RBS 805; the three extradition-procedure papers in Inv. No.5018, 8 Jan. 1802; and the record of the Gijben murder case in Rechterlijk Archief Hoge Heerlijkheid Groesbeek, criminal cases, inv. no.6. The birth certificate of Van Egmond’s eldest child is in the Staatsarchiv Mainz (Mainz, Federal Republic of Germany), GUI 1808, no.278 (9 April 1808). W. J. Van Veen, “VAN EGMOND, ANTHONY JACOB WILLIAM GYSBERT,” in Dictionary of Canadian Biography, vol. 7, University of Toronto/Université Laval, 2003–, accessed April 19, 2019, http://www.biographi.ca/en/bio/van_egmond_anthony_jacob_william_gysbert_7E.html.